The Korean invasion started with the burgeoning popularity of K-Pop, Koreanovelas, and of course, the food. And with this comes Bistro’s authentic Korean restaurant, Bulgogi Brothers. Inspired by the flavorful cuisine from South Korea, Bulgogi Brothers aims at nothing less than the best in Korean food. 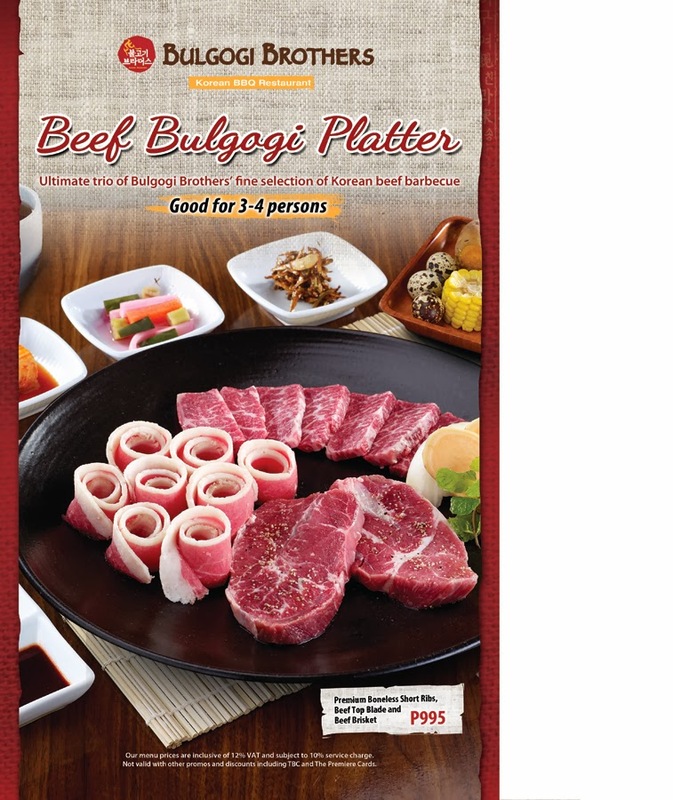 Bulgogi Brothers joins in the Filipino tradition of holiday rush and Christmas madness, with sharing platters perfect for groups of friends or families just hanging out and having casual talk over lunch or dinner. Bulgogi Brothers presents the Beef Bulgogi Platter, the ultimate trio of Bulgogi Brothers’ fine selection of Korean barbecue good for three to four persons served with six side dishes and tea of the day. This platter is available in two options. Platter 1 consists of L.A.-style short ribs, strips of bone in beef short ribs marinated in the special bulgogi sauce, beef top blade seasoned with the original herb-infused BBQ salt, and rolled beef brisket seasoned to perfection. Platter 2 consists of best-selling short ribs marinated with Bulgogi Brothers sauce, tender cuts of beef top blade seasoned with our original herb-infused BBQ salt, and rolled beef brisket seasoned to perfection. Both platters are available at only Php995 per platter. Bulgogi Brothers will definitely satisfy all your Korean-food cravings this holiday season as they offer these sharing platters from December 1 until February, available in all five branches at Greenbelt 5, SM Mall Of Asia, Alabang Town Center, Harbor Point, and SM Lanang Premier. Drop by any of your Bulgogi Brothers branch and celebrate the Christmas spirit in Korean flavors.